The Spin: Jeffrey Wright makes a compelling appearance as new series regular Dr. Valentin Narcisse, the man behind the talent loaned out to Chalky’s Onyx Club, who exploits the mess Chalky’s man, Dunn, made last week to insinuate himself into Nucky’s world and get a piece of Chalky’s pie. Though Narcisse is certainly intriguing, the writers are starting to spin their wheels with Chalky who is caught in a continuous spiral to no development where he’s trying to be a “king” only to ruled a “servant” by those around him. The Muller formerly known as Van Alden is sent by O’Banion to spy on Capone and make sure he’s staying in Cicero and not coming back to Chicago. Capone, though suspicious, is happy to use Muller in some voter intimidation, where Muller gets clubbed in the head, which makes one wonder is it the blows to the head that are making the Muller character dumb and dumber or is it lazy writing? Meanwhile, there’s some pointless “domestic” stuff where poor ol’ Eddie attempts to resign in a ploy to get Nucky to finally give him respect. The season’s highly disconnected Agent Knox plotline introduced last week continued to get odder as the writers use it as a vehicle to introduce a wily chap leading a new bureau of investigation…named…you guessed it…J. Edgar Hoover. Out in the wild blue narrative yonder, Harrow’s motives for his killing spree become clearer as we learn about his sister’s predicament. Lastly, best-selling author Dennis Lehane has joined the writing/producing empire and his signature could be found on director Sakharov’s atmospheric disposal of last week’s sleazy femme fatale – a fitting fate that sets up what is promising to be the season long conflict between Narcisse and Nucky. Wait Until Next Week: The star-studded “new players” club continues with the appearance of Patricia Arquette. 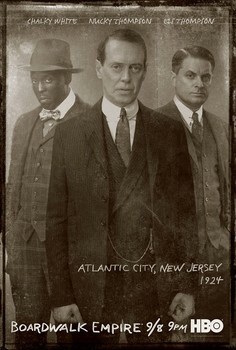 This entry was posted in Boardwalk Empire: Complete Episode Guide, Pop Culture, Television and tagged 1920's, Alik Sakharov, Atlantic City, Boardwalk Empire, Boardwalk Empire Blow by Blow Episode Guide, Dennis Lehane, HBO, Howard Korder, Jack Huston, Jeffrey Wright, Michael K. Williams, Michael Shannon, Mobsters, Prohibition, Terence Winter, TV Series.